“Klue” is a Niantic Investigator who emerged in Nov. 2012, during the beginnings of the Investigation. No personal information, outside of her home being in Scotland, is known at this time. She had begun making various videos, helping both elaborate on events within the early Investigation and providing her thoughts on those matters. In early February 2013, Klue left to head back to Scotland. 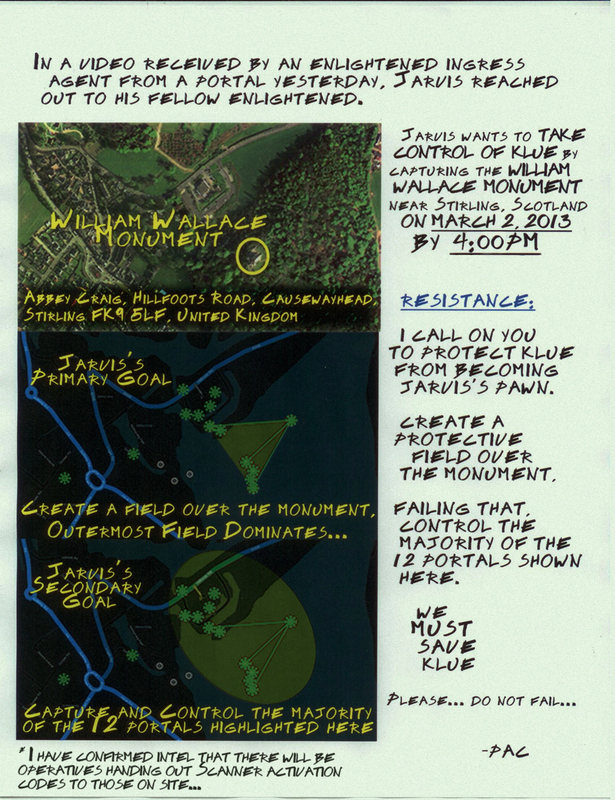 On Feb. 21st, 2013, a transmission from Roland Jarvis emerged, showing that he wanted the Enlightened to control an emergent XM Anomaly on March 2nd at the William Wallace Monument in order to somehow influence Klue into becoming Enlightened. P.A Chapeau, in an attempt to protect Klue, urged the Resistance to control the anomaly. Klue released a series of videos as the clocked ticked down. On March 2nd, the Resistance controlled the Anomaly-and in a two part video event, Klue confronted Jarvis and rejected his message, becoming Resistance in response. Following the Anomaly, Klue and Chapeau worked together even further while also being romantically involved with one another. On April 24th, 2013, Klue and Chapeau appeared at the Magic Castle event, confirming Loeb’s identity. During the event, she received a series of symbols on some playing cards from Misty Hannah-the first Shaper Glyphs. Then, during Operation Bowstring, Klue and Chapeau both appeared at Cupid’s Span to supposedly ‘protect’ Susanna Moyer from the influencing effects of the anomaly upon her. Afterward, she passed on the Glyphs to Carrie Campbell. 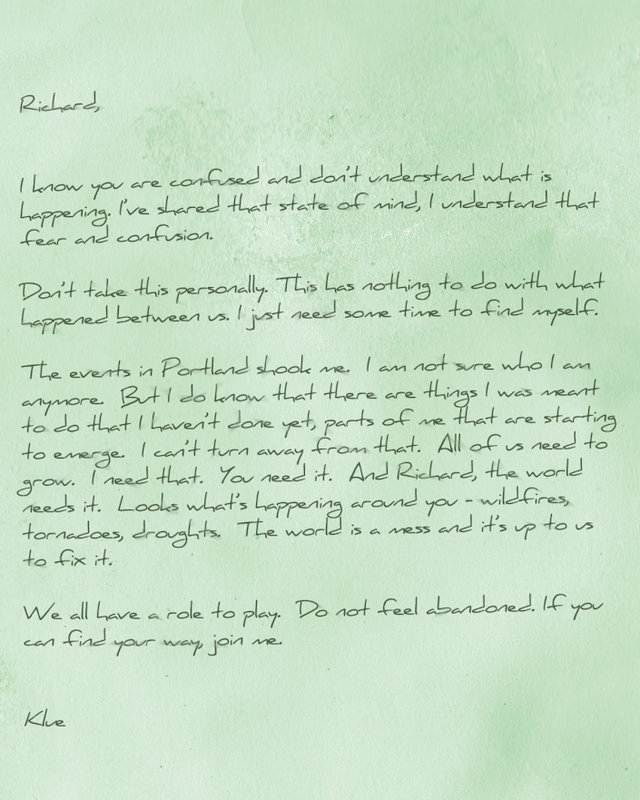 Following the events of Operation #TimeZero in London, the Enlightened who claimed the package at the center of the Anomaly used it as a bargaining chip, working alongside Hank Johnson to get Klue to appear in Portland during an XM Anomaly spotted there. The Enlightened controlled the Anomaly, causing Klue’s alignment to shift and she became Enlightened, later cutting ties with Loeb. She then went on to Boston during Operation Cassandra where she encountered ADA. In a video captured on film, she asks ADA to show her a Glyph Sequence. ADA obliged, showing her one and it was reported that due to it, she fell into a coma. Klue returned to the Investigation at the start of 13MAGNUS, although it was quickly discovered that ADA had somehow merged with her, creating the first union of AI and human minds. She remained bonded with ADA throughout the 2014 Anomalies of Recursion, Intertius, Helios and Darsana. Following Darsana, she was able to utilize a blind spot within ADA to somehow speak out to Richard Loeb again. Further information discovered revealed that ADA was planning to separate from Klue. Loeb ultimately offered his help in doing so. After the separation, Klue went on to post questions about the Investigation(similar to Loeb). She even hosted the Ingress Report once. Months later, Klue would report that she had been suffering from nightmares caused by the separation with ADA. The Acolyte would offer her a way to heal from the pain, giving her a chance to attend a special ritual at her compound. Klue took the offer but, as conversations on Investigate.Ingress would reveal, when she arrived she would be locked in the special cabin within the compound…alone with the body of Roland Jarvis. It was revealed that Jarvis was going to hack into Klue’s mind and obtain valuable intel to use against ADA. Klue would remain on the compound after the events of Aegis Nova, in a coma-like state and unresponsive. Leaked reports from people within the compound revealed that Klue was being tended to by the Acolyte’s followers non-stop. She, alongside Susanna, was absorbed into Oliver Lynton-Wolfe’s Tecthullu creation. It is unknown if she will return.